Have you ever wanted to work on a railroad? Have you ever wanted to help run a train? Our railroad is operated by volunteers and YOU could help. 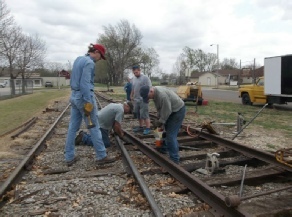 Become a volunteer on the Abilene & Smoky Valley Railroad. mowing the right-of-way; among other things. please give us a call at 785-263-1077 or (toll free) 888-426-6687. Our volunteers are what keep this train available for the enjoyment of all!